Is my existing piano worth restoring ? If your piano was made by one of the major leading manufacturers, then the chances are that it is worth restoring. The cost of buying a modern or new replacement could be considerably higher than the cost of restoration. However, in the case of the more commercially manufactured instruments, it is worth considering the replacement costs before making a decision. And sometimes the older pianos, manufactured at the end of the 19th or beginning of the 20th centuries using older style mechanism and different styles of stringing may not be worth restoring. 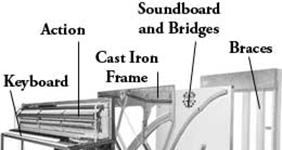 Having said that, it is possible to have a new modern mechanism made for your old piano, if you wish to keep your piano for sentimental reasons, and this would rank very highly in your decision. Many clients have restored the old family heirloom for that very reason. If your piano was manufactured before the 1970s then we would recommend the fitting of a humidifier. This comes at many different models and prices, but it will counteract the effects of modern living conditions (central heating and double glazing) and maintain the correct humidity and atmosphere to extend the life of your restored piano. Having just had your piano restored, you do not want it to dry out and for the soundboard, or tuning plank to split. In more modern pianos, the timber used has been seasoned and kiln dried in order to stand up to the drier living conditions that we have today. 2. 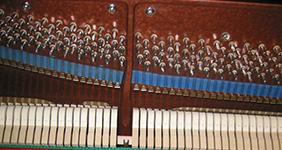 Action and Key Restoration:There are two levels of work involved in the action repair or restoration of a piano. Sometimes it is only necessary to carry out work that will take up to one day, and can usually be achieved in your home. In other circumstances the mechanism will have to be fully restored in our workshops. 3. Casework Restoration: Again, there are various levels of restoration from the revival of the case by removing many years of grime and dirt to the complete stripping off of the old polish, filling the flaws, then staining and polishing the case. An alternative finish today is to spray the piano with a high gloss polyester finish. The work carried out depends on what your piano requires, and, needless to say, every piano is different. 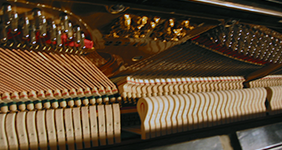 Markson Pianos are able to inspect and advise you on what you and your piano requires. Obviously it will also depend on what you require from your piano. A beginner‘s requirements will be very different to the very good amateur pianist, which, again, will be very different to a professional musician. Would it be cheaper to buy a more modern or new piano? 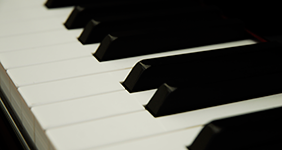 Whether your piano is worth restoring or replacing will depend on your requirements. Do you want a very modern piano sitting in a 17th or 18th century house, or would you prefer something more in keeping? Mostly we will always advise that you visit our showrooms and workshop to have a look at what is currently available, to have a look at the quality of our craftsmanship, and then you will be in a much better position in order to make your decision. What do I want to achieve at the end of the restoration process? At the end of the process, be it replacing, or restoring, we at Markson Pianos want to ensure that you are satisfied that you have made the correct decision that fulfils your personal requirements. You may have wanted a piano suitable for you and your family to play for many years ahead. It is always good to have a beautiful piece of furniture in your home, especially with the added bonus that it makes wonderful music. If you do not have a pianist, we at Markson Pianos have the ability to fit a mechanism to your piano that will play it for you. There are literally thousands of discs available, with or without a full orchestral accompaniment. At the other end of the spectrum, if you do not want anyone to hear you playing the piano, we can fit a mechanism where only you can hear what you are playing through headphones. So you can play away whilst the family watched television in the same room, or are they trying to do homework? We need to know the manufacturer of your piano, which you will usually find on the lid over the keys. If you can, it would be useful to know the number of the piano, which can be found inside the top lid, either on the side of the piano, or on the iron frame. Also useful would be to receive some photographs of the strings and of the mechanism so that we establish the type of piano that you have. Please provide your contact details, and we will then be in touch with you. We can have a general discussion and offer you various options. If we agree that an inspection is worthwhile, we will make the necessary arrangements, after which we will provide a report and estimate for the work to be carried out. 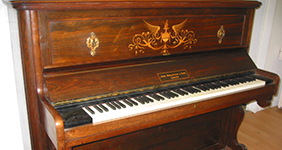 We are able to offer you a replacement piano for the duration of the restoration, should you require one. Restoration can take anything from three to six months depending on the amount of work necessary. "Thanks to Marksons for their excellent refurbishment work on our grand pianos, and the very impressive as-new rebuild of the Bechstein grand which has been such an asset in our chapel this year". Old hammers in need of some TLC ! Hammers after some TLC ! Inspection & Discussion This is where either one of our senior directors, or technicians will visit you to view your piano and carry out a thorough inspection and test to see exactly what NEEDS to be replaced or repaired. They will at this time discuss with you further options and give their recommendations. Agreeing the Work You will in a few days after the visit, receive a detailed report on the condition of your piano, together with our recommendations regarding either its overhaul or its entire restoration. Only the parts which NEED to be attended to will be quoted for, and at each step you will be advised accordingly. The Strung Back The Strung Back comprises of five primary sections which are the Bracings, the Cast Iron Frame, the Tuning Plank, the Soundboard and the Strings. 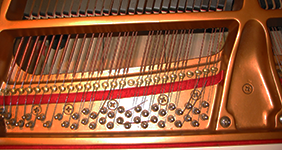 The Action & Keys Briefly stated, the way a piano action works is that the down pressure on a key is converted to a forward motion of the hammer towards the strings. The hammer travels five times as far and approximately four times as fast as the front end of the key does, the key travel being only about 3/8 of an inch at its front edge. This is accomplished through a remarkable system of levers and pivots which, for a quality piano, must be adjusted to the utmost accuracy, making the action so responsive to the player's touch on the keys that there is almost no limit to the musical effects obtainable. For a better, more natural leverage, piano keys slope slightly downward towards the back and become level when the key is depressed. The Casework The Case of the piano is the outer wooden cabinet that houses all the components and adds aesthetic beauty to the piano.It must be strong and durable and should be constructed of very hard woods. Most are made up of laminated construction in order to add more strength. In fact, solid wood cases have been extremely rare in piano construction at any point in history because such a piano would be less likely to endure over time. The most common woods used are maple, mahogany and luan. A very popular feature in pianos today is the finishing of the wooden case with a material known as polyester. This adds an extreme lustre to the finish known as high polish. However, there is still a great deal to be admired in the more traditional finishes.